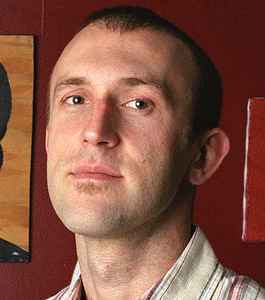 Born as Ramble Jon Krohn on May 27, 1976 in Eugene, Oregon, but Columbus, Ohio was where RJD2 was born. Starting off as the producer behind Megahertz (or simply Mhz), and coming out on his own in 2001 on the Def Jux Presents... compilation. From there, he's grown from being labeled "the next DJ Shadow" to standing on his own, making music alone and producing beats for others. Without overexaggeration, RJD2 has been one of the most influential artists in my life - he is quite simply a genius. It goes without question, but if there should be only one example of why sampling SHOULD be considered an artform in itself, it should be the example RJD2 sets when he flips old, obscure soul tracks into beautiful soul-wrenching masterpieces. And it's not about the quality of production neccessarily. RJD2 operates in a universe far from concerning himself about such "insignificant" details - ie if a loop is cut containing a few miliseconds of the following measure or the crackle-popping of the vinyl sample. His "rough around the edges" universe only cares that the overall productions drip with human emotion and soul. And by god they do. RJD2's drums are a thing of wonder. Take for example the ethereal feel of 'Some's Second Kiss' and 'One Day' from "Since We Last Spoke". I can't remember the last time tracks made me feel so human. Without a doubt, RJD2 is one of the leading producers of his time.